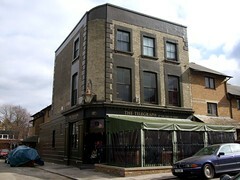 Pub in the Telegraph Hill area of New Cross. Note: According to the Peckham Peculiar, the Telegraph has come under new management since we last visited, so some or all of the below may be out of date. The Earl of Derby was originally a local pub serving a residential side-street north of New Cross Road, at the edge of Telegraph Hill. The area has become greatly gentrified over recent years, and after a few years of closure the pub reopened in February 2009 as something fitting its new tranche of local residents. Out the front a covered area has been constructed, while inside some period features are retained. There's a particularly attractive bar area, as well as plentiful wooden pews in the capacious rear room. A vast map of the world decorates one wall, while on the other side of the pub are two open fires with fresh logs of wood giving off a little bit of extra heat. There are four handpulls for ale at the bar, serving Fuller's London Pride (£1.60/half pint) and Chiswick, and Gale's HSB and Swing Low on the pub's opening (unchanged a month later), well-kept as you'd expect. There are also a range of regular lagers, as well as Fuller's Honey Dew, Litovel (original and red, with slightly higher alcohol percentage), and Leffe. Food is served, a fairly short menu including Sunday roasts, and the place was packed out on its first Sunday. There's a specials board above the bar, listing a number of vegetarian options. On a Sunday visit in April 2009, the menu had four mains options (beef and lamb roasts, a fish pie, and a vegetarian choice), as well as a few starters and some desserts. Ewan and Jo had the vegetarian option, a perfectly decent asparagus risotto, with shaving of parmesan on top (£8) photo. Sarah's lamb roast was substantial, with plenty of trimmings (£8.50). Music is playing, but not too loudly. Upstairs there is a function room. They advertise a quiz on Monday evenings from 8pm. A commenter on this page (August 2011) implies (but doesn't state explicitly) that there's an open mic night every other Wednesday. Last visited by Ewan, Sarah and Jo, 5 April 2009. Last edited 2017-12-17 13:17:26 (version 13; diff). List all versions. Page last edited 2017-12-17 13:17:26 (version 13).